For more complicated banners, or to take advantage of the design expertise of our creative staff, telephone us, or visit one of our neighborhood stores. Our wide format printer produces paper and vinyl banners up to 54 inches wide (4.5 feet) and up to 50 feet long. Working from digital photographs and graphic design files, we can help you design your banner then print it for you in full, rich color, and high definition. We can print banners on heavy duty paper for indoor use, but most often print them on vinyl, for greater durability or for outdoor use. To ensure long life, we use long-lasting, fade-resistant inks. For even longer life, we can laminate outdoor banners with a UV-resistant overcoat. A banner is different from a sign. Signs are printed on, or attached to stiff backings, while banners are printed on strong, flexible paper, canvas or vinyl, and are meant to be hung from a few points. We install metal grommets in the corners and edges of our banners, for easy, secure hanging. Banners sometimes carry pictures or logos, but they almost always carry words-words that are meant to be read. Font size is important of course. Bigger letters are easier to read than small ones. Color and contrast are important, too. And the design of the individual letters, the choice of font, can make a big difference in both the readability and the appeal of your message. 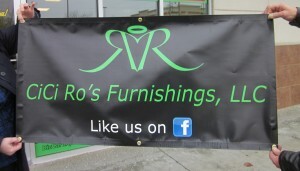 Most of our customers have never bought a banner before, but we produce them every day. To achieve the best results with your banner, consult with our experienced graphic designers. 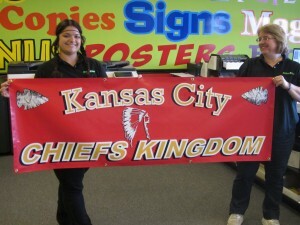 Call us at 816-459-7552 in Gladstone, MO, or visit us today for all your customer banner printing needs.